The Leadership in History Awards program was established to encourage standards of excellence in the collection, preservation, and interpretation of state and local history in order to make the past more meaningful to all Americans. By publicly recognizing superior and innovative achievements, the Leadership in History Awards serve as an inspiration to others in the field. Projects: programming, civic engagement, exhibitions, restoration projects, etc. Applicants can self-nominate or nominate another project. Deadline for nominations is March 1, 2014. The next small grants deadline will be Friday January 10, 2014. Contact the Grants Office with questions. The Grants Office will be sending the annual monitoring reports out in April 2014. As you know, the Letter of Agreement (LOA) your organization signed upon receipt of your grant requires notification to our office of any planned visual or structural alterations to the property the grant pertains to. Since the spring is when many construction projects begin, this is a perfect time for your organization to re-iterate to us any work you may have planned. The reports sent in the spring will be considered your 2014 reports, but we ask that you include any work done since the completion of the last monitoring report at the end of 2012. Minnesota history in colored pencils. Are philanthropists shifting their interests away from museums? St. Cloud State University, St. Cloud MN, seeks Archives and Digital Projects Librarian. Deadline: December 10, 2013. University of Southern Indiana, Evansville IN, seeks Assistant Professor of History/Public History. Deadline: December 15, 2013. Smithsonian Institution seeks applicants to its James Smithson Fellowship Program. Deadline: January 15, 2014. Grand Portage National Monument and Grant Portage Band of Lake Superior Chippewa, Grand Portage MN, seek artist for Ojibwe Heritage Murals project. Deadline: January 31, 2014. Mercer Museum of the Bucks County Historical Society, Doylestown PA, seeks Curator of Exhibits. Indiana Historical Society, Indianapolis IN, seeks Local History Partners Coordinator. Position open until filled. Michigan State University, East Lansing MI, seeks Director, MSU Museum. Position open until filled. Stan Hywet Hall & Gardens, Akron OH, seeks Director of Museum Services/Curator. Position open until filled. South Dakota State University, Brookings SD, seeks Director, South Dakota Agricultural Heritage Museum. Position open until filled. Oklahoma State University, Stillwater OK, seeks Curator of Education. Position open until filled. Carlton County Historical Society, Cloquet MN, will host its November Friday Movies at the Museum on Friday November 29, 2013, 1 p.m. Watch highlights from 1970s Cloquet High School football games and the 9th Northeast Dairy Day (Pine City, 1961). Call 218-879-1938 for more information. St. Louis Park Historical Society, St. Louis Park MN, presents "Celebrating the 1970s" at the Historic Milwaukee Railroad Depot, weekends, November 30-December 15, 2013. History Center of Olmsted County, Rochester MN, announces the upcoming Mayowood Mansion Christmas Tours, now through December 7, 2013. Find more information and tour schedule online. Call 507-282-9447 for more information. Pond Dakota Heritage Society, Bloomington MN, hosts Colette Routel, who will speak on "Alexander Ramsey and the Dakota Bounty," Sunday December 1, 2013, 2 p.m. Call 952-484-0477 for more information. Wright County Historical Society, Buffalo MN, hosts their 3rd Annual Online Auction, Monday December 2 to Friday December 13, 2013. Bids close promptly at 4:30 p.m. on December 13. Call 763-682-7323 for more information. Anoka County Historical Society, Anoka MN, will celebrate the season with a book event for "Keepers of the County: Crime and the Anoka County Sheriff's Office," the opening of a new toy exhibit, "Toyland," and an ornament presentation from the City of Spring Lake Park, Tuesday December 3, 2013, 7 p.m. Call 763-421-0600 for more information. Wright County Historical Society, Buffalo MN, opens the Festival of Trees with a lighting ceremony, Tuesday December 3, 2013, 6:30-8 p.m. Call 763-862-7323 for more information. Carlton County Historical Society, Cloquet MN, hosts Allen R. Anway, who will present on "The Greatest Scientific Prize Ever Awarded in History," Wednesday December 4, 2013, 1 p.m. Call 218-879-1938 for more information. Join Nicollet County Historical Society, St. Peter MN, for "Strongman," Thursday December 5, 2013, 7 p.m. Call 507-934-2160 for more information. Scott County Historical Society, Shakopee MN, hosts a Christmas Open House, December 6, 2013, 6-8 p.m. Contact SCHS, 952-445-0378, for more information. W.W. Mayo House, Le Sueur MN, will offer candlelight tours Friday December 6 and Saturday December 7, 2013, 6:30-8:30 p.m. Call Nicollet County Historical Society, 507-934-2160, for more information. Chippewa County Historical Society, Montevideo MN, hosts "An Icelandic Christmas in the Village," Saturday December 7, 2013, 10 a.m. to 4 p.m. Call 320-269-7636 for more information. Isanti County Historical Society, Cambridge MN, hosts Dolly & Me Christmas Tea, December 7, 2013, 1-3 p.m. Tickets: $10/person; for girls ages 5 and up. Limited seating; call 763-689-4229 by December 1 to order tickets. Maplewood Area Historical Society, Maplewood MN, hosts a Holiday Open House at the Bruentrup Heritage Farm, December 7, 2013, 1-5 p.m. Call 651-900-3539 for more information. Blue Earth County Historical Society, Mankato MN, hosts "Christmas at the Hubbard House," Saturday December 7, 2013, 3-7 p.m.; and Sunday December 8, 1-4 p.m. Call 507-345-5566 for more information. Enjoy the elegance of the beautifully decorated LeDuc Historic Estate, Hastings MN, which will be open for tours and shopping, December 7-8, 14-15; 10 a.m. to 5 p.m. each day. Call 651-437-7055 for more information. LeDuc Historic Estate, Hastings MN, will hold a Victorian Holiday Dinner, Sunday December 8, 2013, 5-9 p.m. Tickets: $50/DCHS members; $60/nonmembers. Space is limited; call 651-437-7055 for more information or for reservations. Blue Earth County Historical Society, Mankato MN, hosts Dr. William E. Lass, who will speak on "Camp Lincoln and the Aftermath of the Dakota War," Tuesday December 10, 2013, 6-8 p.m. Call 507-345-5566 for more information. Join Minnesota Association of Museums for their next Sampler at American Swedish Institute, Minneapolis MN, Wednesday December 11, 2013, 4-6:30 p.m.
LeDuc Historic Estate, Hastings MN, hosts a Victorian Creme Tea, December 14, 2014, 4 p.m. Cost: $12/person. Reservations required; call 651-437-7055. Scott County Historical Society, Shakopee MN, hosts a Family Christmas Tea, December 14, 2013, 1-3 p.m. Make a holiday ornament to take home, and enjoy tea and treats. Fee: $8/person for supplies. Limited space; call 952-445-0378 for reservations. Westonka Historical Society, Mound MN, hosts Jeff Skaret, who will speak about his book "God's Fingernail," December 14, 2013, 11 a.m. Books will be available for sale. Call 952-474-9800 for more information. Join Pond Dakota Heritage Society, Bloomington MN, for a Christmas Celebration at the Pond House, Sunday December 22, 2013, 2-4 p.m. Call 952-484-0477 for more information. Westonka Historical Society, Mound MN, will host a program about the history of "Ski Tonka," January 11, 2014, 11 a.m. Call 952-474-9800 for more information. Paul Bunyanland Cultural Historical Society will meet Saturday March 1, 2014, Grand View Lodge on Gull Lake, Nisswa MN. RSVP to Jeremy Jackson, 612-554-5737. AASLH offers online class "Managing Contacts, Donations, and Membership with PastPerfect 5.0" December 10-12, 2013, 10 a.m. ET. 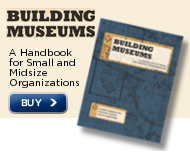 Cost: $86.25/$69 AASLH members. Call 800-562-6080 to register. University of Minnesota Extension offers a Social Media for Business webinar, January 29, 2014, 11 a.m. Register online. Minnesota Historical Society has published their Annual Report for Fiscal Year 2013. LeAnn Atchison, Willmar MN, is the winner of the Kandiyohi County Historical Society Logo Contest. The winner was chosen by the society's membership at their annual meeting in October. Push mower, approximately 60 years old, and bedroom set, approximately 100 years old. Contact Bob Mack, 612-341-4051, for more information. Minnesota State Arts Board announces that their FY 2015 Operating Support grant applications are now available. Deadline for eligible arts organizations: Friday January 24, 2014, before 4:30 p.m. Contact Bonnie Schock, 651-215-1612 or 800-866-2787, for more information. With Biking Magazine naming Minneapolis the 2012 most bikeable city in the U.S., a historic movement appears underway to facilitate bicycle transportation and recreation. Since past is prologue, rest assured that Minnesota has had a long association with bicycles, be it the velodrome or Greg LeMond. Juston Anderson, captain of the Minnesota division of the Wheelmen, and Brent Fuqua of Re-cycle Bikes and Service in Minneapolis (left to right) propose a bicycle history organization that would include a museum. They would appreciate hearing from you about your thoughts on an organization that could assist history museums across Minnesota. The Creator's Game by Art Coulson. New! Available from Minnesota Historical Society Press.